Background: Melanoma is the most aggressive type of skin cancer. Metastatic melanoma is extremely difficult to treat with current therapy methods such as surgery. On the other hand, it is a good opportunity to develop a radiopharmaceutical using a radionuclide such as Technetium (Tc) for diagnostic and Rhenium (Re) for therapeutic purposes. T3,4BCPP has been be used as a radioimaging agent for melanoma cancers experimentally. 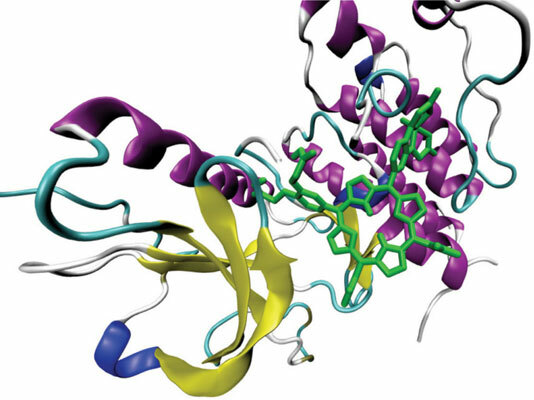 The aim of the present research was to design new imidazolylporphyrin derivatives with better selectivity and higher affinity than those of T3,4BCPP by molecular modeling. Methods: Eight types of Re- and Tc-labeled imidazolylporphyrins were docked to Fibroblast Growth Factor Receptor 1 (FGFR1, PDB ID: 5AM6) using AutoDock 4.2. FGFR1 was simulated by Molecular Dynamic (MD) simulation for 30 ns using NAMD 2.10 at 37 °C. The obtained conformations were then applied in a molecular docking simulation. Dovitinib (natural ligand of FGFR1), Re- and Tc-T3, 4BCPP were used as references. Results: The MD simulation resulted in an RMSD of 3.8 Å. From all the studied imidazolylporphyrin derivatives, Tc-cD3, 4BCPMIP and Re-cD3, 4BCPIP had the best docking parameter. Tc-cD3, 4BCPMIP had a free binding energy of -4.06 kcal/mol, while that of Re-cD3, 4BCPIP was -4.35 kcal/mol. Conclusion: It is concluded that cD3,4BCPMIP and cD3,4BCPIP are two potential candidate ligands for a melanoma radiopharmaceutical kit. FGF, ligand, melanoma, molecular docking, imidazolylporphyrin, radiopharmaceutical.